Brrrr… Rain and snow all day yesterday, with much speculation of a race cancellation. This is the first of two races this year that our team is responsible for putting on, so we were all hoping that it would be a ‘go’. Especially since it’s been cancelled/rescheduled a couple of times due to weather in recent years. Anyway, we actually woke up to sunshine this morning – nice! It wasn’t long before the clouds rolled in, though – and the temperature dropped, and dropped, and dropped. I don’t know how cold it was at the start, but it was plenty cold enough… All of the pines up on the mountain above us were covered with snow. I was pretty excited for this race, for a few reasons. It’s an awesome climb first of all, lots of switchbacks, etc. (Here’s a link to a bit of history about the road). 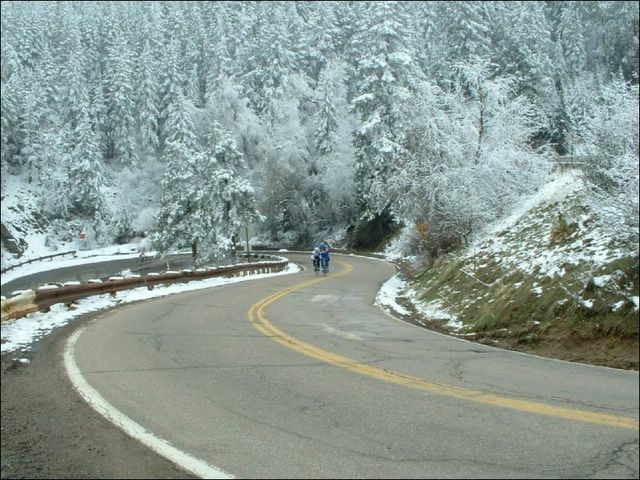 I have trained on it several times this year, recently managing to beat my last year’s race time by around a minute and a half – and that was with a couple hours of hard riding before I got to the base. So I was optimistic that I would have a pretty good ride with it being a mass start and me just having a race-specific warmup in my legs before the start. This was also a BAT (Best All-around Team) race, with points up for grabs in that season-long competition. AND – it was my first race on my new bike!! The reality ended up being a bit different from the dream (typical story), but all in all I’m fairly happy with the outcome. I finished 22nd out of 80 in my category, but more importantly to me, I was second out of the 10 guys on my team. That was pretty satisfying for a used-to-be 220 pound dude. Most of my teammates have being activey racing for at least the last 3 years or so and I’ve had some lost time to make up for. I ended up setting a personal record (by 2 seconds! – 23:07), which was cool, but I was hoping to knock another minute or so off of it. I feel like I am somewhat overtrained. Not in the classic sense of the word (i.e. burnout), but more like my legs are tuned for a 3-4 hour event. Not a 20+ minute puke-fest… When I did a 100 mile ride through the mountains two weeks ago, I finished feeling really strong. That ride included a 24 minute ride up today’s climb, only with 4 hours and 6,000 feet of hard climbing in my legs before hitting the base. That was mainly why I was hoping for a faster time today. Maybe I’m being too much of a data junkie, just need to shut up and ride! The start was a little packed. I got caught behind some guys that were having trouble clipping in and shifing their gears. After we got underway, I could see Steve (teammate) leading the charge up ahead. I have a lot of respect for Steve as a rider (did a 21:06 last year) and I really wanted to see if I had what it took to hang with him. 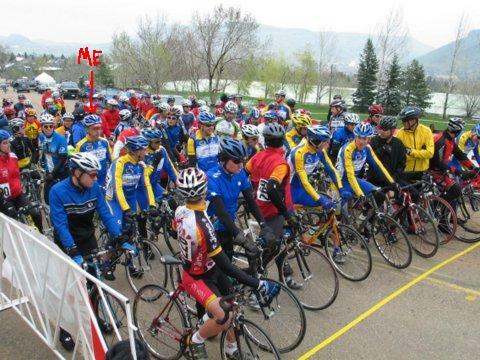 I had to expend a fair bit of energy to get myself up through the pack to the front. Once I got there, I was feeling ok (and loving the snappy accelleration of the bike) when a guy took off out of the pack. Another guy went after him, and I decided to launch as well. Wow – they went HARD. I could never quite close the gap and decided to sit up and try and conserve a little before what was left of the group came up to me. In hindsight, I should have stayed tucked in the group instead of flapping in the wind… Once the group of 12 or so came up to me, I basically went straight through them to back. Before I knew what happened, I was dangling 10 meters behind. Dang it!! Knowing I didn’t want to be mad at myself after the race for being lazy, I redlined it and clawed my way back up. By that time, the group was falling apart and the riders I was latching on to were getting dropped themselves. I was already way into the red so back I went. From the halfway point on up, I would get passed by someone every couple of minutes. That was by far the most frustrating thing. I would rather have finished strong by saving myself earlier and picking off riders at the end. Lots more fun that way! This climb has an interesting finish because it flattens out enough at the top so you can throw it into the big chainring and wind it up for the last 300 meters or so. Brad, another teammate that I have a lot of respect for and is a really good climber, was gaining on me FAST. I was going cross-eyed, but managed to hold him off by a few inches. Kyle was the first finisher on our team, he got 6th. Hats off to him, he’s a mucho fast hombre – I should know, he flies past me at the time trial every week! Posted on May 1, 2005, in bike, race. Bookmark the permalink. Leave a comment.